Customize the Server Ribbon UI of your SharePoint and Office 365 solutions without learning the Ribbon XML schema. Specialized components allow you to quickly build custom ribbons and add a new ribbon to your existing projects. This is a true RAD tool for customizing the Server Ribbon UI of your SharePoint and Office 365 solutions. 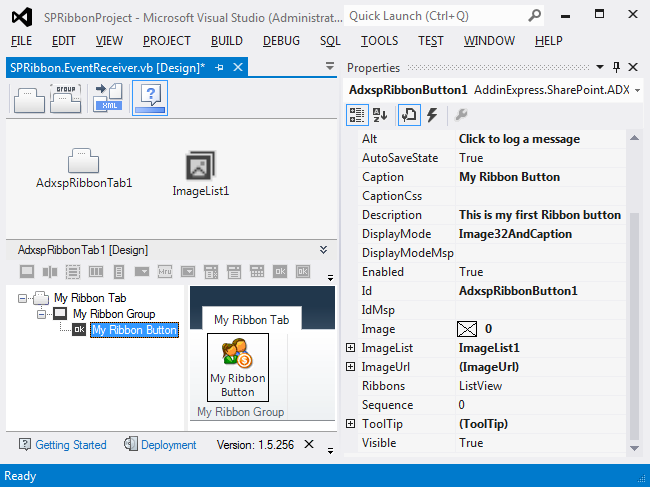 Specialized components of the Ribbon Designer allow you to quickly build custom SharePoint ribbons and add new ribbons to your existing projects. You don\'t need to spend hours learning the Ribbon XML schema. You use visual designers to handle all routine tasks while you focus on the applied code that implements your business rules. ScreenCamera SDK is the easiest and quickest way to show and capture real-time desktop capture inside your Company`s video streaming and monitoring solutions. It is practical, safe, easy-to-integrate, light, cost-effective, and quickly embeddable.